Earlier topic: keeping old ink workable? In 2016 I have written a master thesis about the contemporary letterpress with the title: “Letterpress and its Revival”. 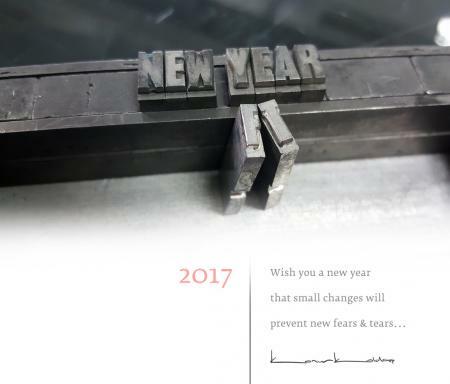 Hope 2017 will be a much better year for all of us and letterpress, happy new year to all the letterpress lovers. And to you as well Konurk. Is your thesis posted for reading? I would like to do that. What America needs is a good revival! Or can you scan it to a PDF and either email it or put it where it can be read and/or downloaded? I also would be very interested in reading it. Would love to read you work. Please post or set up a link if posssible. Thanks for the comments, unfortunately it’s written in Turkish. When I have time to translate it to English, ofcourse I’ll share it with foreign letterpress communities too. Konur — my son who is fluent in Tartar, Turkish descent right?, may be able to do that … I will check! they are from the same language family, but as I know, they are quite different. the best thing I’ll do is to translate it to english I think. more than 100 pages will take time, but sharing is good. various ways for about 50 years! Have the accents for Modern Turkish but only in 10 point and have printed a poem in that. I was surprised, recently, to see NEW tabletop presses being manufactured and sold on EBAY. I have since learned that this actually started back in 2008. Somebody is making aluminum CNC machined knockoffs of the Adana 5x8 & 6x9. I would say there is hope, if someone is willing to gamble on making NEW presses. When Im doing historical reenactment and talk to people about rescuing presses, I point out that we are doing much better at rescuing old equipment now. The NEW problem is rescuing the type. Mats are being melted down for brass value, type for reloads and sinkers, and the antique dealers who dump the type into buckets for sale on EBAY so they can sell the type cases for thimble collections! Don’t forget H F Richard in London are making new Albion presses, highest quality. Regarding the new Albion presses, I think the makers name is actually Harry Rochat. They look very nice indeed. Harold platen many thanks for your correction….appreciated….I did not check the “predictive text” on the tablet sufficiently!!!!!! Spell checker ain’t so bad but oh boy when the tablet just does not like what you write…..then you have to press delete to cancel the word that you have just written that was correct……sighs…known Leon Lynne and family some 25 years….BTW did you assist Justin Knopp set up his Wharfedale? Many years ago I tried to find a home for one in Hampshire from Moody Printers no-one wanted it…plus tried also with other people tried to find an owner for the Wharfedale Reliance from Felix Topolski studio…..wonder if it is still around….I tried to get this info through to Dorset Branch of BPS as they were attempting to set up a museum???? Amberley museum has a small one which doesn’t get run much……..